Rubbing with salt or baking soda are two easy ways to remove tea stains in containers. Bleach can also be tried. This is a guide about removing iced tea stains from plastic pitchers. Here's an easy way to remove those brown tea stains that accumulate in plastic pitchers. Alternate using the pitchers for tea with tomato juice or pineapple juice. The acid in the juices eat the stain off the plastic. Works with plastic glasses, too. I just whip mine out with baking soda after each use. A paste of a little baking soda and water do wonders to tea and coffee stains in my mugs. A paste of baking soda is great to scrub out greasy pots and pans. If it's really gunky add a couple of drops of dawn dish liquid. No harsh chemicals needed. 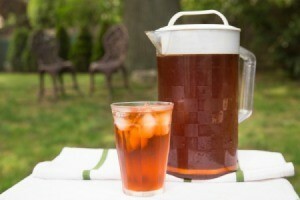 After making iced tea in the summer, I am always left with a stained pitcher. NOTHING I used would take those stubborn stains off. I tried expensive soaps to elbow grease. Then one day, I tried BAKING SODA. Within seconds of sprinkling a little baking soda right on the stain and rubbing it in, the tea stain was gone. It works for coffee too. I have always heard it's a cheap and natural cleaner, but this sold me. Now I have no more stained coffee cups, tea glasses or ice tea pitchers! Source: Figured out after trying every other product. It was desperation! A sprinkling of salt on a damp paper towel or cloth will work just as well, won't leave any residue (as baking soda might), rinses off immediately and is recommended has been recommended by coffee and tea mavens for centuries. It's also cheaper. I live in an area with hard water, mineral deposits and just devilish conditions for water use. Any cup of coffee or glass of tea stains the cups and glasses so SO bad. I have worked for the last 10 years since I moved here to solve the problem. I just found two completely wonder, work saving and time saving solutions. Baking Soda and Salt. Either or worked great in just seconds on cups that have been stained for weeks. Thank you SO much!